“The Fall of the City”, a 1937 CBS radio drama by Archibald MacLeish that starred Orson Welles and Burgess Meredith, is considered one of the most socially significant – and boldly experimental – works in the history of radio. Written in response to the rising tide of fascism in Europe, the production innovated key sound effects, some of which, ironically, were later employed by Joseph Goebbels in rallies he orchestrated for Adolf Hitler. TIME hailed the play as “the most ambitious radio play ever attempted in the US.” It went on to say, “Aside from the beauty of its speech and the power of its story, “The Fall of the City” proved to most listeners that the radio, which conveys only sound, is science’s gift to poetry and poetic drama.” WNYC will present this still highly relevant work by revisiting it in its original context and re-presenting it in a production for our time. Both evenings will begin with a short audio documentary, narrated by Radio Lab host Jad Abumrad, recounting the original broadcast, featuring interviews with film director Peter Bogdanovich, film and television critic Leonard Maltin, and Oxford Book of American Poetry editor David Lehman. Archival audio of MacLeish discussing his work as “a play about the way people lose their freedom” and clips from the original production are included as well. Written and produced by Sarah Montague. A new production of this powerful classic will follow. The cast includes Kevin Cristaldi as The Announcer, with Jonathan Hadary, Paul Hecht, Karen Kandel, Brian Lewis, Steven Rattazzi, James Rebhorn, Barbara Rosenblat, and Rocco Sisto. The Chorus features students from Elisabeth Irwin High School and the theatre program at Eugene Lang College: The New School for Liberal Arts, with WNYC staff members. Wendy and Lisa (shown), the dynamic musical duo formerly of Prince and the Revolution, have composed an original soundscore. Play directed by Sarah Montague; chorus directed by Arthur Yorinks. Cast: Kevin Cristaldi; Jonathan Hadary; Paul Hecht; Karen Kandel; Brian Lewis; Steven Rattazzi; James Rebhorn; Barbara Rosenblat; Cecilia Rubino; and Rocco Sisto. “The Fall of the City” was directed by Sarah Montague; assistant director, George Zarr. Production assistants: Kara Gionfriddo and Miranda Shafer. Recording and mix engineers Claes Andreasson; Robert Christiansen; Edward Haber; Stuart Kennedy; and Bill O’Neill. Audio/visuals: William Porter; Lighting: Sam Gordon. Broadcast host: David Garland. Chorus: Vera Aaron; Jamal Ali, Misha Beiser; Trive Boode-Peterson; Devon Brown; Joanna Chak; Lynette Dent; Deion Desir; Henry Dwyer; John Gentile; Hope Goodrich; Kirsten Hess; Sarah Jadin; Nazir Khan; Ali Krasner; Mark Larrimore; Heather Lewis; Michael Lincoln; Jennifer Munson; Alison Murphy; Robbie Neuhaas; Cameron Ng; Charlotte Peters; Alex Risinsky; Celine Robinson; Alex Rochinski; Erica Rodger; Cheryl Rogers; Cecilia Rubino; Roberto Sanabria; Danny Sarmiento; Andrew Smrz; Derek Spaldo; Caitlin Wilson; Margaret Wiggins; Emily Winkler-Morey; Valentino Yung. Director of Drama, Elisabeth Irwin High School: Meghan Farley Astrahchan; Coordinator, Eugene Lang Drama Program: Cecilia Rubino; additional direction by Arthur Yorinks. Wendy Melvoin and engineered by Michael Perfitt. “The Fall of the City” was produced and presented by WNYC Radio’s Jerome L. Greene Performance Space in collaboration with the Yorinks Theater Group. For The Greene Space: Executive Producer, Indira Etwaroo; Technical Director, Gil Shuster; Production Manager, Sue Edwards; Special Projects, Jenny Langsam; Lighting Designer: Sam Gordon; and Arthur Yorinks: Artistic Coordinator, A New Theater of Sound. 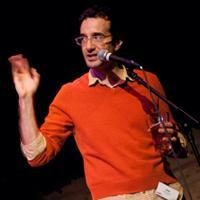 “The Fall of the City: Prophetic Classic” was written and produced by Sarah Montague, and narrated by Jad Abumrad. Archival recordings of Archibald MacLeish were provided courtesy of the Archibald MacLeish Collection at Greenfield Community College and The University of Massachusetts Press. This documentary was researched in part by students participating in the Radio Play Works class at Eugene Lang College: Rose Annis; Katelyn Buckley; Sophie Conti; Kara Gionfriddo; Amanda Hoes; Sarah Huseman; Peter McPartland; Kaitlin McQuaide; Gregory Roberts; and Alexander Yellen. In addition to those credited above, to whom thanks are also due, the producer would like to thank Anthony Appiah, Chris Bannon, Robin Bilinkoff, Peter Bogdanovich, Dean Cappello, Aaron Cohen, Rex Doane, Nina Gray, Kirsten Reoch, and Rebecca Robertson of Park Avenue Armory, Jennifer Houlihan, Margaret Howland of the Archibald MacLeish Collection, Theodora Kuslan, Andy Lanset, David Lehman, Leonard Maltin and Alice Maltin, Cara McCormick, David Nolan, Molly Peacock, Craig Pospisil, Philip Proctor, Max Schmid, Ivan Zimmerman, and special thanks to Biff Liff and the Estate of Archibald MacLeish.